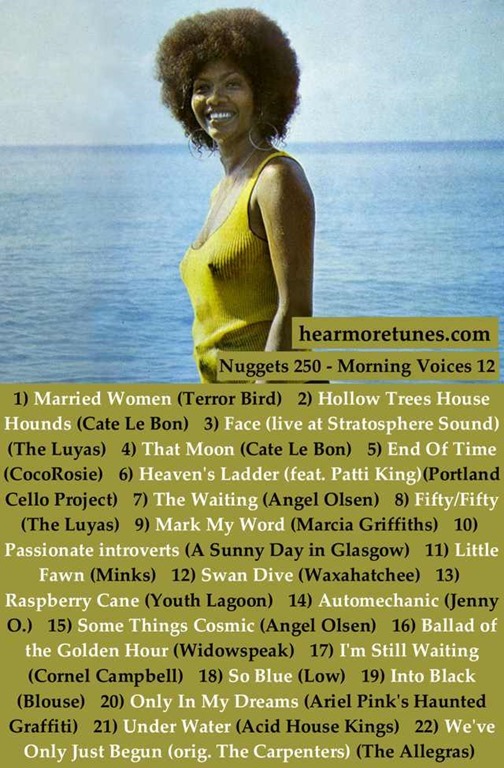 An early morning mix; mellow, haunting and occasionally twee. For those curious about the Carpenters track that rounds off this mix, read more here. Cate le Bon – Hollow Trees House Hounds. Give her a big hand, she’s Welsh! CocoRosie – End of Time. Totally bonkers. Many reviewer give the Casady sisters a D- but they have their supporters. I like them fine. Waxahatchee – Swan Dive. Katie Crutchfield is all grown up now, so I suppose there won’t be so much screaming, which is a shame. Ariel Pink – Only in Dreams. Crazy but good. He has a few demons. Angel Olsen. She can sing and yoddle at the same time. No mean feat. I am impressed by how quiet the crowd is in this clip of her singing. Portland Cello Project attempt a track from Beck’s sheet music release. Youth Lagoon – Rasberry Cane. Bedroom keyboard mystro made good. Saw him at SXSW2012, it looks like he made it back this year.